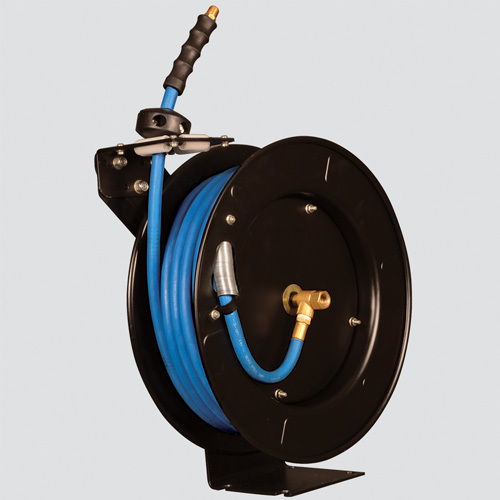 Apache's air hose reel is an auto-retracting, all-steel constructed reel with a corrosion resistant black powder coated finish, a 12 point ratchet gearing system, and adjustable guide arm. Reel can be horizontally or vertically mounted. Comes complete with a 1/2" x 50" ultra-light rubber hose assembly with 1/2" male threaded fittings. Hose resists extreme weather, abrasion, and is oil resistant to RMA Class C standards.